I made this cake for my daughter’s friend’s birthday. 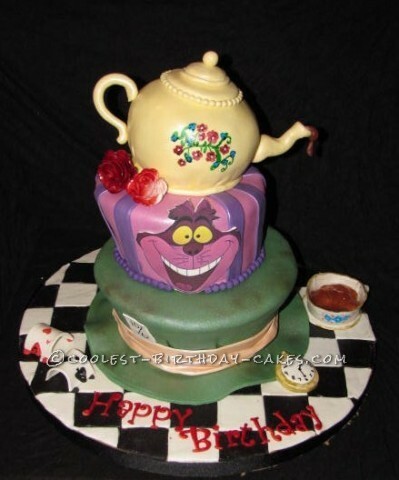 Theme was Alice in Wonderland ~ Mad Hatter tea party!. I absolutely adore this little girl and wanted to make sure it was over the top! I tried to incorporate a bunch of Alice in wonderland themes, including the Mad hatter (of course), the soldiers, Cheshire and even half painted roses!! Everyone who came to drop their children off were in awe of the cake, the little girl it was made for LOVED it and I even walked into the kitchen at one point to find the grandparents taking pictures of it!